Jury selection presents a difficult challenge to trial lawyers, and calls for skills that are generally out of step with the rest of what they’re expected to master in order to get from filing to verdict. At the point of empaneling a jury, lawyers are expected to listen more than they speak, to learn more than they teach, and to embrace the case weaknesses and opposition that they would normally try to downplay. It is a subtle and demanding situation, and one that calls for not just advocacy, but for friendliness, sensitivity, and all the traits of genuinely good communication. For law students and for practicing attorneys who have not yet mastered jury selection, there is a new resource focusing broadly on the fundamentals. The 2018 book, Jury Selection Handbook: The Nuts ands Bolts of Effective Jury Selection, is available in both print and ebook versions and is published by Carolina Academic Press as part of “The Lawyering Series,” to support law schools and law professors in providing more innovative and practical content. The authors are Ronald H. Clark, Distinguished Practitioner in Residence at Seattle University’s Law School and Thomas M. O’Toole, a Seattle-based litigation consultant. Overall, the book is a very useful resource for the firm’s library, the litigator’s shelf, and the law school classroom. In this brief review, I will call out three points: The book covers the fundamentals, provides a wealth of applied examples, but also paves the way for more advanced advice on jury selection. Living up to its “handbook” label, the text aims toward comprehensive coverage of the process and providing both a legal and practical foundation. It includes an overview of the law relating to selection and challenges (Chapters 2 and 3), preparation and assistance for jury selection (Chapters 4 and 5), achieving the goals of voir dire (Chapters 6 and 7, as well as 9 through 12), questioning techniques (Chapter 8), evaluation of jurors (Ch. 13), motions relating to voir dire and jury composition (Chapter 14), as well as a number of related class assignments (Chapter 15), and a series of useful checklists at the end. Throughout, the authors call out good advice in clear and simple terms. For example, noting that the fundamental principle of voir dire is to facilitate easy expressions of bias, they write, “You want jurors to reveal how they feel about issues in the case, because otherwise you will not be able to determine whether or not to deselect them. Therefore, no matter how damaging the jurors’ response might be to your case, do not let it show either in your body behavior or voice. Make it pleasant and safe to talk to you” (p. 152). And a corollary of that principle is that you want to do more listening than talking. “The more you talk during jury selection,” they continue, “the less time the prospective jurors will talk, and consequently you will draw out less information from the jurors” (p. 155). Perhaps the area where the book most differentiates itself is through the use of constant examples and in providing a wealth of additional information for use in classrooms and continuing legal education programs. The examples are appropriately realistic and drawn from court transcripts (included in the online supplemental material). Many of the examples are extensive, allowing readers who may not have much in-court experience to understand the rhythm and flow of conversations with prospective jurors. The text includes a number of useful reference lists, such as logistical matters to know about your judge’s procedures (pages 88 and 89), and ends with ten useful checklists for attorneys preparing for voir dire. Additional resources are also found in a teacher’s manual, which I did not review, but which includes a syllabus for law school classes as well as a schedule of instruction for CLE’s material for role-playing exercises. The book’s aim is to cover the fundamentals of jury selection, and sticking with that purpose, it is for the most part reflective of mainstream thinking. That is to say, the book provides a foundation grounded in practice, but points toward the importance of some more advanced questions. It is conventional in focus, but based on its purpose, that isn’t a criticism. Ultimately, though, it did strike me while reading it that it is much more an attorney’s view of voir dire rather than a social scientist’s. There are some more advanced but still essential psychological factors, such as the unreliability of juror’s own self-assessment of bias and the lack of general awareness and control over biases, and these factors may be undersold in the book. For example, in describing the process of making cause challenges, the authors note, “after the juror has conceded harboring a bias, have the person admit that he cannot set the bias aside and decide the case fairly and impartially.” An auxiliary point worth noting is that, whether the person makes that admission or not, bias is not naturally subject to voluntary and conscious control. In other words, we can’t simply “set aside” a strong, settled, and potentially unnoticed cognitive or psychological bias as if it were a pair of reading glasses. In the authors’ defense, the law and process of jury selection embraces the principle that the juror can do that, and the book aims to teach students to work within that set of assumptions. As a part of that emphasis, the book also includes frequent examples that seem to overemphasize the value of promises to be fair and of “commitments” from potential jurors generally. In its understandable reliance on courtroom transcript examples, the text shows a preference for what is realistic and typical over what is ideal. The examples include a great deal of what I call “CYBF” (or “Could You Be Fair?”) styles of questioning: They can be useful in talking a potential juror out of the other side’s attempted cause challenge, but are far less useful for getting a real and reliable statement on the person’s actual fairness. “One way to avoid misleading answers,” the author’s note, “is to craft jury selection questions that do not suggest a correct or socially acceptable answer” (p. 280), but many of the examples seem to do exactly that. Many of the examples similarly include questions that seem to be designed more to send a message than to actually learn information. It is telling that in these examples and many others, the questions result in the appearance of universal agreement from the panel: Everyone agrees that the ‘little dog’ company deserves $300 million if it can prove it lost $300 million, and everyone agrees that they wouldn’t ignore the judge’s instructions in evaluating Costco. Of course, there is sometimes a need to send that message, for example showing in a criminal case that, “We all agree with the presumption of innocence.” But as a matter of emphasis, those questions do not uncover bias or lead to information that is otherwise helpful in informing one’s strikes. Most of the precious time in talking with a panel should be spent exploring disagreement within the panel in a way that will tell you who to strike and to challenge for cause. Jury selection, of course, is very individual, and there are some facets of advice given by any book that will conflict with someone else’s preferences. That is normal. For me, there is too much emphasis on eliciting agreements and promises from jurors, and not enough emphasis on the structure of responses and the broad sequence of questions (e.g., asking a question that divides the group and then following that up with open-ended thematic questioning). The authors are also agnostic on some subjects that, I believe, could use more advocacy from the academic and social science communities: the value of social media searches (p. 94), the advantages of supplemental juror questionnaires (p. 103), and benefits of using jury consultants (p. 111), for example. Ultimately, the text aims to establish a lawyer’s or law student’s foundation by providing a good working knowledge of the conventions of jury selection, and that it does in a well-illustrated fashion. 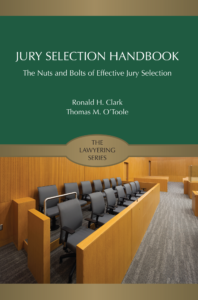 For anyone wanting fresh or refreshed learning on the principles, the law, and the practice of effective voir dire, Jury Selection Handbook: The Nuts ands Bolts of Effective Jury Selection is a resource that belongs on their shelf. Note, Persuasive Litigator did receive a review copy of the book. While we have no financial interest in the publication, we do occasionally and mutually refer work to and from Dr. Thomas O’Toole, one of the book’s authors.